September 23, 1858: DON’T wash your hands! This is one of the classic stories of public health, an issue that most U.S. history and world history texts tend to ignore, to the detriment of the students and the classroom outcomes. 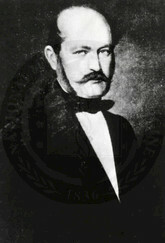 Semmelweiss’ superiors shared Dubois’ opinion; when the Hungarian physician insisted on defending his theories, they forced him to resign his post on the faculty. Gotta wonder what Dr. Dubois would make of the suits and sanitation procedures required today for health professionals who treat Ebola victims. Semmelweis Reflex: The Semmelweis reflex or “Semmelweis effect” is a metaphor for the reflex-like tendency to reject new evidence or new knowledge because it contradicts established norms, beliefs or paradigms.